Housing and Infrastructure Development Minister Ronald Chitotela says a new State House has been budgeted for in the 2019 budget. Chitotela said this when he featured on ZNBC’s Radio 2 program called Economic Outlook. He said the construction of a new State House is based on 2017 recommendations of the Parliamentary Committee on Works and Supply. He said the committee had recommended that there is an urgent need for government to commence modalities to construct a new state house in view of security concerns. In 2017 the then Minister of Works and Supply Mathew Nkhuwa announced plans for construction of a new State House at a cost of $20 million US dollars and emphasised that the plan could not be put off any longer but the plan met resistance from various sectors of the country. Nkhuwa had stressed that the current State House had developed cracks and was a danger to the President and State House members of staff. 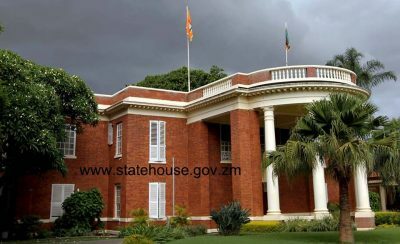 In 2017, government said the $20 million US dollars for construction of the new State House had been provided in the 2018 budget but construction ever took place and there is no explanation on where that allocation was channelled to. Meanwhile the government is currently constructing a new Government House (Official residence for the vice president) in Lusaka. The construction started early last year but has however been kept secret after the 2017 proposal to construct a new State House was widely condemned as a bad priority.